Alongside working on Beauty Bible, Jo's been involved in a very special project that she wants to share with you... A life-long lover of perfumes, it came to Jo a couple of years back that there was no 'appreciation society' for perfume. So, with a friend and colleague - Lorna McKay, former fragrance and beauty buyer at Harrods - she's set one up. 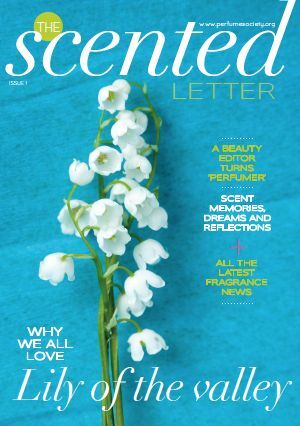 At the heart is a massive, informational website - but it's much more than just a website: there's a chance to try all sorts of fragrances, attend events, and receive a beautiful downloadable magazine, The Scented Letter, all about fragrance; the first issue goes out this week. • Invitations to ticketed events with leading ‘noses’ and key figures from the perfume world, in-store events, workshops, etc. • Your first Perfume Discovery Fragrance Edit ‘discovery box’ as a joining gift (seen at the top of this page), featuring eight beautiful samples, smelling strips, a complimentary handbag-size Crabtree & Evelyn Lily Hand Cream (and of course your subscription card), together with ‘Fragrance Notes’ postcards and an embossed Note Book, so you can share your thoughts about the scents – and start to deepen your appreciation of perfume and the scented world. • A complimentary workshop – for 2014, ‘How to Improve Your Sense of Smell‘, which will be hosted at locations nationwide. • Suggested activities for your own local ‘Perfume Group‘ – like a book club, but without the homework…! • ‘Access All Areas‘: you’ll be able to read special content on the website that is created for subscribers-only, including ‘nose’ interviews, vodcasts, podcasts and more. • You will also be first to know about each of our new limited edition Perfume Society Discovery Boxes - to help you discover new perfumes, and improve your sense of smell, which are available only to subscribers (and at a special price) for the first two weeks after they launch, or till they sell out (whichever is the sooner). For more info and to sign up, click here - and Jo and Lorna look forward to seeing you…!